“FatherReader” here — one of the advantages of being the site’s editor is that I have full posting privileges, and can add messages without MotherReader’s approval or authorization. 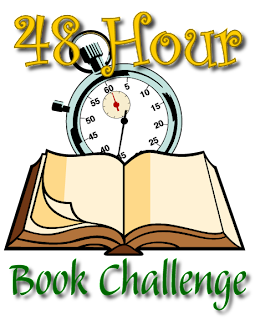 I just wanted to add my own thanks to everyone who participated in this year’s 48 Hour Book Challenge — the turnout was far greater than we ever could have expected, and everyone who joined in deserves special recognition. But mostly, I wanted to congratulate MotherReader on all the hard work she’s put in on the competition. For something that started as just a “Hey, wouldn’t it be neat to see how much my blog-friends and I could read in 48 hours?” notion has really blossomed into a seminal kidlitosphere event. The downside, of course, is that the amount of preparation and coordination involved has gone through the roof. I know that — even with the event officially “over” — Pam spent the entire day yesterday checking blogs, running tallies, and otherwise wrapping things up in a neat little bow (and with my day booked at work, I couldn’t even pitch in to help out). Such dedication! Thanks again for hosting. It was my first time participating, but I'm positive now it won't be the last. And happy belated birthday!! Happy belated birthday. Thanks for all that you have done! Happy belated birthday! Thanks for all you do-this was my first 48 hour challenge and I had a blast, Congrats on a great job. Pam rocks! Just wanted to add that it didn't go unnoticed how much time Pam put into the community aspects of the challenge this year. It seemed like every time I stopped by a post to comment, MotherReader had already been there. Showing us all by example how much better things are when you're part of a community. If I just decided to read a lot on my own some weekend, well, that would be fun. But the 48HBC is truly something special. Happy birthday! Thank you for all that you do--with this challenge, and for the reading/blogging community in general! MOTHER READER ROCKS MY READING SOCKS OFF! And happy birthday! Hurray for you, FatherReader, for sharing the birthday news and for your support! Happy, Happy Birthday, Pam! And many thanks again for a great and well planned Challenge and all your encouragement throughout the weekend. Well happy belated birthday, Pam! Happy birthday (belatedly) and another heartfelt thank you! I think everyone involved appreciates all the hard work involved in organising this thing! Thanks, Pam for all the time, thought, etc. you put into the 48HBC! It was my first, but not my last time for sure! Happy Birthday. Remember to count your friends, not the years!!! Happy Birthday Mother Reader!! And many, many thanks for helping me have one of the best weekends I've had all year. Happy Birthday, Mother Reader. And thanks for hosting such a fun event. Happy Birthday and a round of applause to the whole Reader family. Happy Birthday , Pam. Thank you for organizing such a fabulous event. It is impressive! and I want to echo what Jen said--you must have spent ages visiting us all to encourage us, and it was great to get your comments. Yes! I add my thanks as well - this is such a FUN weekend for us bloggers and you are so welcoming to newbies and old pros alike. I think the community aspect was great. My only trouble is that reading about what others read made me "to be read" pile grow instead of shrink as I read. Amanda: Making the TBR pile is one of the sneaky side-effects of the 48HBC. We should be warned, eh? Happy belated birthday, Pam! Thank you for all that you do. Oh wow! Happy Happy Happy Birthday Pam!!! You gave us all a present by doing the challenge for us and gathering all the prizes, tallies, data, links, etc. You are my hero!! PS my word verification is "imacia" I'm a see ya! Happy Birthday Pam! That has been a truly awesome experience and it's been wonderful to "meet" so many awesome bloggers. Thanks for all your hard work! Thanks, FatherReader and MotherReader! I was quite impressed the entire event. You deserve many thanks and applause. Best wishes to you and yours. Happy belated birthday! Thank you for all you put into it! Already looking forward to next year!